Savannah is the birthplace of Georgia and the alluring backdrop of the novel “Midnight in the Garden of Good and Evil.” Consider these top 10 family friendly attractions when visiting this historic seaport. The Savannah Children’s Museum is an outdoor venue where children can explore coastal Georgia. Guests will become archaeologists, train engineers and mad scientists for the day. They can also explore a life-size maze. The hands-on, interactive exhibits and play equipment encourage creativity. The Tybee Island Marine Science Center introduces families to the marine life near Savannah. Experienced naturalists lead tours in the area’s bio-diverse sand dunes and tidal marshes. Children can search for indigenous birds and aquatic animals. During the 90-minute Turtle Talk, guests learn fascinating facts about loggerhead turtles and visit their native habitat. ArtZeum at Telfair Museum’s Jepson Center for the Arts has 24 hands-on, interactive exhibits. Two floors of this contemporary art museum are dedicated to activities for children. Young guests can write on the walls, touch the artwork and create their own masterpieces. ArtZeum challenges visitors to reconsider their opinions about art. Zip Tours of Hilton Head is a two-hour eco-adventure. Aerial bridges, treetop platforms and zip lines provide a bird’s-eye view of moss-shrouded oaks, tidal marshes and rivers. A popular attraction is the 900-foot-long dual racing zipline. Tour guides provide insight into the natural surroundings as you move from station to station. 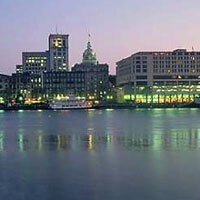 The Marine Education Center and Aquarium enables children to explore current and ancient aquatic life around Savannah. The center’s 14 exhibit tanks feature 50 species that inhabit coastal Georgia, including turtles, fish and invertebrates. There are also exhibits displaying the skeletons of sharks, armadillos, mastodons and woolly mammoths. Children will enjoy the center’s touch tank. Forsyth Park is a neighborhood urban green space that features a small botanical garden. Amenities include walking paths, play structures and an extensive lawn. Children will enjoy watching water spurt from the fountains. The water turns green for St. Patrick’s Day. The park hosts various outdoor concerts and other live performances. Old Fort Jackson is the oldest extant brick fort in the United States. The fort has a museum displaying a variety of weapons and other military objects. Children can learn about the daily lives and responsibilities of soldiers in the early 19th century. The fort has daily interactive programs and fires its cannons on weekends. Savannah Dolphin Watch takes you out past Tybee Island on a 41-foot twin turbodiesel vessel. Families can view Atlantic bottlenose dolphins as the friendly animals frolic in the surf. During the two-hour, narrated cruise, the ship sails near numerous historic landmarks, including monuments, forts and lighthouses. The Waving Girl is a popular statue on the route. The Georgia State Railroad Museum has an operational turntable as well as a variety of historic locomotives and railcars. The facility chronicles the history of railroads in Georgia. Children can operate handcars and explore this antebellum railroad facility. The museum has daily guided tours, blacksmith demonstrations and train rides. River Street Marketplace is an open-air shopping venue that features local cuisine and handicrafts. Children can watch artisans as they work. The entire family will enjoy the street performers, festivals and concerts. More than 50 shops display merchandise from across the world.